No new words can be added to the existing text, but words can be deleted. The order of the words cannot be changed. The column of text excavated from the prose piece comes with built-in line breaks, but these can be altered —i.e., words can be shuffled between lines so long as their order is not changed. Punctuation can be added and deleted at will. I highly encourage others to try this exercise for themselves. 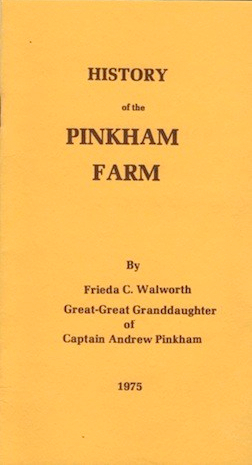 The source text for “Excavated History of the Pinkham Farm” is “History of the Pinkham Farm” by Frieda C. Walworth, the great-great granddaughter of Captain Andrew Pinkham, published in 1975 and available as a small pamphlet from the Bethel Historical Museum. View pictures of our visit to the Bethel Historical Museum below. The museum is open on the first Saturday of each month from 1-4 pm.